Arfak is a mountain range that is located in the south of Manokwari city. Most of its region is still covered by tropical rainforest. A lot of species of plants and animals that live in the mountains. Some of them include Lesser Birds of Paradise (Paradisaea minor), Cuscus Possum, Papuan Frogmouth, various kinds of big trees and lianas, glowing mushrooms. Mount Susnguakti is located in the eastern region of Arfak mountains. Birds, mammals, and marsupial animals live in its forest including cuscus possum, dwarf cassowary and birds of paradise. There are no guesthouses in the jungle. Local guides have built tents for tourists who want to stay there for several days. Hiking and Birding - To watch paradise birds, visitors need to wake up early in the morning at around 05.00. After that drinking tea or coffee and eat some biscuits, visitors need to walk for approximately 30 minutes down and up some steep slopes and walk through a river to reach the the trees where paradise birds like to gather, dance and mate. The birds usually are usually active between 05.30 and 09.00. To enhance birding experience, visitors need to bring a good pair of binoculars. 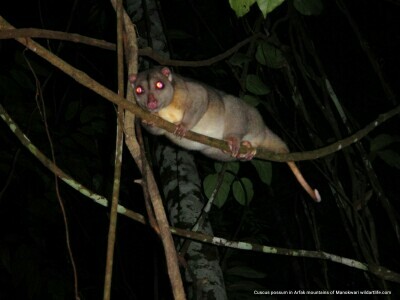 Night Walk is conducted to find Cuscus Possum that like to come out at night to find food and mate. Cuscus is a nocturnal animal. It lives in trees. It is still in the same family with other marsupial animals such as bandicoot, wallaby, and tree kangaroo. Raja Ampat regency is the habitat of hundreds of species of birds, mammals, insects, and reptiles. It is also the home of unique vegetations including the giant strangler ficus, and the beautiful terrestrial and arboreal orchids. I often organize tours to the islands for tourists who are interested in exploring the rainforest of Waigeo island or other smaller islands in the regency. Red Bird of Paradise, and Wilson's Bird of Paradise are some of the vocal points of the tour. The birding tour to Raja Ampat is can also be combined with sightseeing and snorkeling tour. Klasow valley is located in the east of Sorong city. It has become a highly recommended site for birdwatching. There are a lot of species of birds that are endemic to lowland forest of New Guinea that can be found in the valley. Some of them include: Northern Cassowary, White Cockatoo, Western Crowned Pigeon, Palm Cockatoo, Lesser Birds of Paradise, King Bird of Paradise, and a lot more.